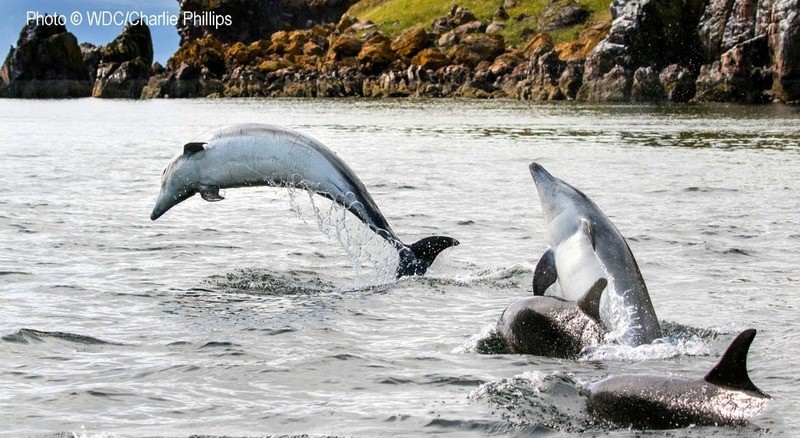 Why does everyone love dolphins - especially, in Scotland, the Moray Firth dolphins? Is it those half-remembered Flipper television shows from childhood? Or is it because they are always drawn with big smiles on their faces? Years ago, when I the manager of the marine aquarium in Macduff, Aberdeenshire, (in the eastern end of the Firth), if dolphins appeared offshore, the staff could empty the place in seconds simply by walking round and shouting ‘dolphins spotted outside’. I used to try countermanding this by yelling ‘Stop, stop, you haven’t been in the gift shop yet!’ But no, there was this mad stampede of exiting visitors every time. And a close viewing is unforgettable, especially if it's from the shore. Are the dolphins easy to photograph? No! Here's my confession about the dolphins in the Moray Firth. They know only to appear when I don't have my camera. They have a reputation for high intelligence but that's still amazing. As I write this, I am trying to outwit them by always carrying it on Moray Firth coastal walks, but inconspicuously, so I have high hopes. Still, you may ask, why bother when the local branch of Whale and Dolphin Conservation (WDC) have a Field Officer who manages to nail them on regular occasions? They kindly let me use a couple of his pictures right here on this page. Click on the two dolphin picture for more info on the work of WDC. I had no camera. So I went back the next day and they were still there, only a bit further out but still close enough for me to take one of the worst-ever dolphin photographs. Yes, I agree, it’s pathetic. (Pictured here.) It’s half a dolphin. But I feel obliged to share it with you. Actually, come to think of it, I could put it on my Loch Ness Monster page – as it wouldn’t be the first time that the back-half (or the dorsal fin) has been photographed, then made into the neck of Nessie. Look, she’s even got two horns, wouldn’t you say? I expect dolphins turn up at river mouths, such as the Spey, to waylay inbound salmon. Anyway, back in the real world, I’ve lost count of the number of times over the years I’ve had to write about these dolphins – in important symbol of wildlife in Scotland. The best-known of our cetaceans are the bottlenose dolphins of the Moray Firth colony. Check out their 'latest sightings' board. They have an exhibition centre and a cafe too, for a warming bowl of soup, perhaps.) Spey Bay is a short drive from Elgin, east of Lossiemouth. Anyway, even if you don’t see the Moray Firth dolphins right at the river mouth at Spey Bay, on the east side if the Spey estuary, then in summer you can often see fishing osprey even before you’ve climbed out of your car . And there are terns and waders galore and about a million pieces of temptingly arty-crafty pieces of driftwood cast up on the massive, stony storm-beach. Finally, except in high summer, a knitted woolly hat (or toorie as we would call it) is also advised, should you wish to blend into the background and to keep your ears from falling off in the wind. Actually, I exaggerate. The Moray Firth, south shore, actually has a kind climate. Naturally, every place and tourism organisation wants to give the impression that the Moray Firth dolphins are on their patch. As well as Spey Bay mentioned above, you’ll hear that Chanonry Point on the north side of the Firth by Fortrose is a great place for them, if you are shore-watching. The Kessock Bridge at Inverness gets a mention. You’ll see them from Fort George, from Nairn and, well, it seems they can pop up anywhere. Even the city of Aberdeen, currently very slowly waking up to the fact that oil doesn't last for ever, claim that it's the best place for dolphin-spotting - and it isn't even on the Moray Firth. The last time I was in Aberdeen, I managed to stalk a dolphin that was hanging about the old quad at Marischal College. (Pictured here) Lucky shot, wouldn't you say? See? Everyone wants a piece of the dolphin action. There are also plenty of nice places to stay in and around the Moray Firth too. I’ve seen the Moray Firth dolphins east of Macduff quite frequently and once, while walking the shoreline just west of Portsoy, I actually heard them before I saw them. There was a kind of gasping exhalation – which I knew right away wasn’t me – and I turned round to find a few of them breathtakingly close inshore. Or perhaps I mean taking a breath close inshore. Naturally, I had no camera. No matter, the point is you’re never sure where you’ll see your next dolphin. That’s part of the fun. There are lots of seagoing types based around the Moray Firth who will take you out in their boats to see them. Check that these businesses all comply with the recommendations in the code of practice known as the Dolphin Space Programme. I know it sounds as though these clever cetaceans are planning their own discovery of outer space (trying to get away from us, probably) - but it's actually about giving them personal space, if you happen to find yourself afloat next to a pod of dolphins. This allows the dolphins to concentrate on - for example - avoiding moronic jet skiers, a phrase which some may consider tautology. Gemini Explorer - for example - runs out of Buckie harbour - all year weather permitting. Oh, by the way, can I interest you in a print that captures the ambience of a sunny day at Spey Bay? Scotland’s dolphin coast - the Moray Firth. (Pictured here) the mouth of the River Spey (beyond the shingle banks, just left of centre) from Kingston, looking east to the town of Buckie and the Binn Hill on the horizon. 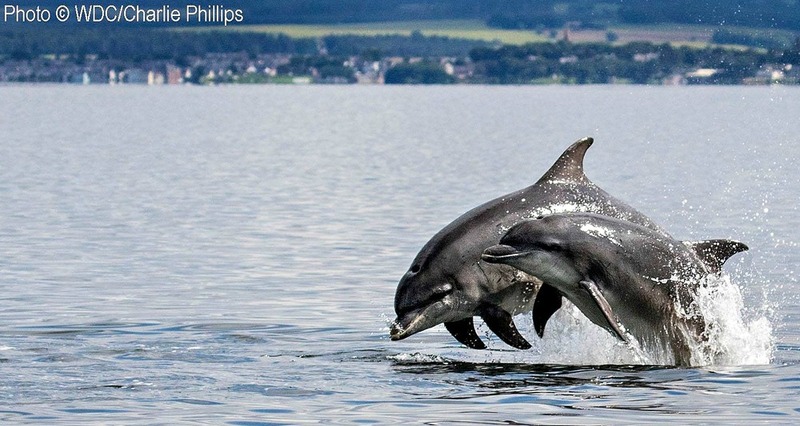 (Pictured here) With all of the Moray Firth to play in, the local dolphins can turn up anywhere – and in flat calm days they can be spotted, ooh, miles and miles out. This pic was taken from a high point west of Covesea lighthouse, Lossiemouth. And those dots are dolphins. Trust me. The smallish mountain is Morven, behind Dunbeath on the north shore of the Firth. Finally, just in case you have been given the impression that the Moray Firth has exclusive rights to cuddly cetaceans, another cetacean hotspot is the Isle of Mull. See link below.